56549, HUBCAP USED, 16", 03-04, MAZDA, 6, SPARKLE SILVER, 7 ANGLED SPOKE, 7 INDENTS ON CENTER RING, RAISED CHROME LOGO, PLASTIC CLIPS & WIRE RING. 56549, HUBCAP USED, 16", 03-04, MAZDA, 6, SPARKLE SILVER, 7 ANGLED SPOKE. 7 INDENTS ON CENTER RING. RAISED CHROME LOGO., PLASTIC CLIPS & WIRE RING. 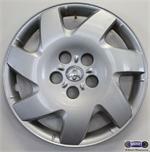 57526, HUBCAP USED, 16", 90-91, MITSUBISHI, ECLIPSE, SPARKLE SILVER, 7 ANGLED SPOKES, ENGRAVED LOGO, PLASTIC CLIPS & WIRE RING. 57526, HUBCAP USED, 16", 90-91, MITSUBISHI, ECLIPSE. SPARKLE SILVER, 7 ANGLED SPOKES, ENGRAVED LOGO, PLASTIC CLIPS & WIRE RING. 61114, HUBCAP USED, 16", 02-06, TOYOTA, CAMRY, SPARKLE SILVER, 7 SLANTED SPOKE, 5 LUG NUT HOLES & CHROME LOGO, 7 PLASTIC CLIPS & WIRE RING. 63776, Used Rims, 15X6, 4 LUG, 115MM 98-00, HONDA, ACCORD, 4 CYL, 7 ANGLED SPOKES, ALLOY. 7030a, HUBCAP USED, 16", 98-11, FORD, VAN, E250, E350, E450, 7 ANGLED SPOKES W/O BRIGHT CENTER & OUTER RING. PAINTED LUGS. ETCHED FORD LOGO, PLASTIC CLIPS & WIRE RING. A=ALL PAINTED LUG NUTS B=IMITATION CHROME LUGS NUTS. 7030b, HUBCAP USED, 16", 97-98, FORD, VAN, E250, E350, E450, 7 ANGLED SPOKES W/O BRIGHT CENTER & OUTER RING. IMITATION CHROME LUGS.